The English Electric Lightning was the first aircraft capable of supercruise. Supercruise is sustained supersonic flight of a supersonic aircraft with a useful cargo, passenger, or weapons load performed efficiently, which typically precludes the use of highly inefficient afterburners or "reheat". Many well known supersonic military aircraft not capable of supercruise can only maintain Mach 1+ flight in short bursts, typically with afterburners. Aircraft such as the SR-71 Blackbird are designed to cruise at supersonic speed with afterburners enabled. 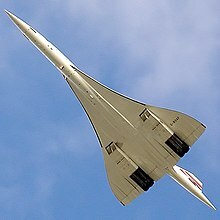 One of the best known examples of an aircraft capable of supercruise was the Concorde. Due to its long service as a commercial airliner, the Concorde holds the record for the most time spent in supercruise; more than all other aircraft combined. The main advantage of Supercruise is the ability to operate without afterburners, which consume large amounts of fuel. Afterburners generally have specific fuel consumption (SFC) of over 1.80 to 2.5, but Supercruising aircraft like the Concorde can have SFC lower than 1.2. This is twice most modern subsonic airliners, but half the consumption of supersonic aircraft using afterburners. Most military aircraft have to use afterburners, or reheat, to travel at supersonic speeds, which are only attainable for relatively short bursts. Afterburners operate by heating the exhaust air and increasing its expansion and velocity, but are very inefficient. This typically limits their use to burst if sufficient fuel is not available. Since efficiency decreases dramatically when afterburners are used, an aircraft that can dry supercruise has greater endurance at supersonic speeds compared to one that cannot. Supercruise capability also provides advantages for stealth aircraft, because an afterburner plume reflects radar signals and creates a significant infrared signature. Supercruise also allows a potential simplification of engine design by eliminating complex intake air diverters and shock cones, but at the loss of subsonic performance. If an aircraft is equipped with engines that are designed to reach their best efficiency during subsonic cruise, they are thus required to operate at close to their maximum pressure ratio at subsonic speeds. In order for the aircraft to cruise subsonically at maximum efficiency while also maintaining supersonic capability, it must be equipped with ramps to divert excessive ram air pressure during supersonic flight. These ramps also serve to deflect supersonic shockwaves away from the intake ahead of the intake itself. If the supersonic air is not diverted, the engines would exceed their maximum pressure ratio and their maximum turbine temperature, because the engines were already operating near maximum pressure at subsonic speeds. The supersonic ram air would exceed this pressure. If an aircraft is designed to supercruise, it does not need to have high compression ratio at subsonic speeds. This means it can use a low pressure engine that uses the supersonic ram air to boost pressure to normal operating pressures. This eliminates the need for supersonic diverter ramps or high compression turbines. It also means the aircraft will have poor subsonic efficiency, as the engine pressure ratios are much lower during subsonic flight. For instance, the Concorde uses Olympus 593 turbines with a pressure ratio of just 15.5:1, less than a third of modern engines, and still far below other engines of its day. But at supersonic speed, the ram air produces a compression ratio of nearly 5:1 ahead of the turbine, producing a total pressure ratio of roughly 80:1, giving it far higher efficiency at cruise, although this severely reduces its subsonic efficiency. The Concorde does have a system of diverter ramps within the intake, but these do not serve the same purpose as shock cones or diverters. The supersonic shock is not diverted outside the intake, it is contained within the intake itself, and the shockwave is reflected off the bottom of the intake. The shockwave is then reflected upwards to a small bypass passage above the engine and behind the shock plate. Other ramps provide cooling bypass air at subsonic speeds, and a ramp nearby the engine allows additional air to be ingested during subsonic flight. These may appear superficially similar to diversion ramps or shock cones, but they serve different purposes. Not all low pressure engines may safely supercruise. Turbines designed for extremely low altitude may have issues with decelerating from supercruise, such as the RB199 engines on the Tornado. As altitude increases the minimum RPM increases to avoid the combustion chamber backfiring through the low speed compressor. The minimum RPM on some engines may be high enough that the engine cannot decelerate above a certain altitude without backfiring, locking the aircraft into a high power rating. If the computer does not allow reduction of RPM below the minimum safe level, the engines can be stuck at a high power rating. This occurred in testing of a Tornado prototype, and the pilot had to turn the aircraft to reduce speed and altitude to a level where the engine controls would allow him to reduce the throttle. A similar safety system on the R-29 engines of the MiG-23 led to the death of US General Robert M. Bond during a test flight of a captured MiG-23. The Concorde routinely supercruised most of the way over the Atlantic, enabling it to travel from London to New York in three hours, a record which has yet to be surpassed by any other commercial aircraft. On 3 August 1954, a Gerfaut research aircraft powered by an SNECMA Atar 101D2A engine exceeded Mach 1 on level flight without using afterburners. The first production aircraft intended to exceed Mach 1 in dry level flight was the un-reheated Armstrong Siddeley Sapphire powered P.1 prototype of the English Electric Lightning, on 11 August 1954. A week previous, on 4 August, the P.1, WG760 flown by Roland Beamont on its maiden flight, had unknowingly exceeded Mach 1 in a climb, although, due to position error, the Machmeter had only shown a maximum of Mach 0.95. Beamont, who had not noticed any change in behaviour of the aircraft, was surprised when informed after the flight data had been analysed. However, this early demonstration of supercruise was extremely limited, as the Lightning could only cruise without reheat at approximately Mach 1.02, while later versions were able to achieve much higher speeds. The BAC TSR-2 strike and reconnaissance aircraft, which first flew on 27 September 1964, was one of the first military aircraft specifically designed to cruise supersonically; one of the planned mission profiles was for a supersonic cruise at Mach 2.0 at 50,000–58,000 ft (15–18 km). Supersonic cruise at lower levels was at Mach 1.1 at 200 ft (61 m). The TSR-2 used Bristol Olympus engines, a later version of which would also power the Concorde. 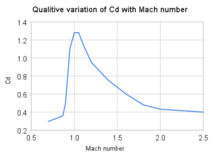 Qualitative variation in Cd factor (Drag coefficient) with Mach number (speed) for aircraft; supercruising above Mach 2.15 is efficient. Only the supersonic transports (SST), the Concorde and the last version of the Tu-144 (the Tu-144M), spent most of their time cruising at their design speeds without needing afterburning. Some combat aircraft that are listed as capable of supercruise may only be able to do so without an external weapons load, for example. Reheat was added to the Concorde for take-off to cope with weight increases that came after the initial design. As it was available, it was also used for transonic acceleration to reduce the time taken and fuel used to reach cruise. The upgraded Tu-144M had more economical engines than the Tu-144, which did not require afterburners during cruise, as well as a more advanced intake design, which increased the full payload range from 3,080 to 5,330 km (1,910 to 3,310 mi) (the Concorde's operational range was 6,470 km or 4,020 mi). The term "supercruise" was originally used to describe a fighter performance requirement set forth by USAF Col. John Boyd, Pierre Sprey, and Col. Everest Riccioni, proponents of the F-16 Falcon. Following the entry into production of the F-16, they began work on an improved fighter design with the ability to cruise supersonically over enemy territory for a minimum of twenty minutes. As air combat is often the result of surprise, and the speed of combat is determined by the speed of the surprising aircraft, this would have given a supercruise-capable design a worthwhile performance advantage in many situations. The postulated fighter would have had a top speed of just over Mach 1, and a fuel fraction in excess of 40%, the minimum required to meet the twenty-minute requirement. The fuel fraction requirement necessitated a very austere design with few advanced electronics. The United States Air Force showed no interest in the proposal at that time, but years later revived the term and redefined it to apply to the requirements for the Advanced Tactical Fighter, which resulted in the F-22 Raptor. The F-22 Raptor is capable of supercruise at Mach 1.8 (but is seen here running afterburner). The Dassault Rafale is capable of supercruising with four missiles and a belly drop tank. The Eurofighter Typhoon is capable of supercruise at Mach 1.5. The F-22 Raptor's supercruise capabilities are touted as a major performance advantage over other fighters, with supercruise being demonstrated up to at least Mach 1.8 Virtually all current and past jet fighters, prior to the F-22, cruise at approximately Mach 0.8–0.9 with militarily significant weapons loads. However, supercruising uses more fuel to travel the same distance than at subsonic speeds, with the Air Force Association estimating that use of supercruise for a 100-nautical-mile (120 mi; 190 km) dash as part of a mission would cut the F-22's combat radius from about 600 nautical miles (690 mi; 1,100 km) to about 450 nautical miles (520 mi; 830 km). This reduction is unconfirmed because the altitude and flight profile are classified, as are most of the F-22's capabilities, but it is still far less of a reduction than would result from the use of afterburner. The EJ200 engine built by EuroJet Turbo GmbH mounted in the Eurofighter Typhoon. It is capable of supercruising at Mach 1.5 with an air superiority missile load. Typhoon pilots have stated that Mach 1.3 is attainable in combat configuration with external stores. The General Electric F414G in JAS 39 Gripen NG is designed for supercruise and has been shown to achieve Mach 1.2. The Snecma M88 that power the Dassault Rafale. The twin engines enable the Rafale to supercruise with four missiles and a belly drop tank. The two AL-41F-1S engines of the Sukhoi Su-35 can achieve supersonic speed without engaging afterburner . Two Turbo-Union RB199 engines in the Panavia Tornado prototype equipped with a Concorde style intake achieved supercruise in testing but the compressor showed dangerous behavior while decelerating at high altitude. The engine had a very high minimum RPM at high altitude, meaning that it could not reduce throttle properly as altitude increased. One aircraft was stuck in supercruise at high altitude and unable to reduce engine power, having to decelerate by turning the aircraft instead. Independently, Russia is working on Izdelje 30 (after AL31F and AL41F derivatives modifications, like 117S turbofan) and RD33MKRU Morskaja Osa; an all new AL-41 engine with a complete redesign underway to add supercruise ability to the Sukhoi Su-57. This has yet to bear fruit, but the stop-gap 117S engine, produced by this program, seems to achieve the supercruise goal already. It was recently announced that during testing of a Su-35BM fighter equipped with these engines it was travelling at just past supersonic speed it continued to accelerate without the use of the afterburner, thus suggesting that it had supercruise capability, though it has yet to be seen whether this will be possible with a combat load. All known supercruise aircraft can only do so at considerable altitude (where the air is thinner and so offers less resistance), which restricts the use of terrain mask for eluding detection. The Lockheed A-12, SR-71 Blackbird, and YF-12, were designed for sustained operation at supersonic speeds using an afterburner. SR-71 missions flew at maximum range cruise, with afterburner settings in the lower portion of the range, about 98% of the time. The Mikoyan-Gurevich MiG-25 was designed for supersonic cruise at Mach 2.35 with partial afterburner in operation. The engines were purposely designed to use an extremely low pressure ratio of just 4.75, but this was boosted by ram air pressure during supersonic flight. Most other fighters of the era had much higher pressure ratios that required ramps or cones to divert excess ram air away from the intakes in order to avoid the high pressure ram air creating excessive pressure and overheating the turbines during supersonic flight. The low pressure ratio turbine of the MiG-25 meant that it did not have to divert excess ram air, instead using the ram air to boost the pressure to a normal operating range. The turbine's low pressure ratio meant poor efficiency at subsonic speeds, and high efficiency at supersonic speeds. Its specific fuel consumption in subsonic flight was 1.12, which was very poor for such low speeds. Its specific fuel consumption in full afterburner in supersonic flight was 2.45, which is actually comparable to much slower aircraft of the day. Due to this, its range at Mach 2.35 was similar to its subsonic range. In a combat situation the MiG-25 could reach speeds of Mach 2.83 for short periods until the airframe temperature reached 290 °C (554 °F). Above that speed the ram air pressure exceeded the pressure ratio and temperature limits of the turbine, but it did not have ramps to release the excess pressure. If these limits were ignored it could reach higher speeds, but would suffer severe damage to the engines. The BAC TSR-2 was designed to cruise at M2.0 using afterburners, and had a predicted top speed of M2.35. It could also cruise supersonically without afterburner, as demonstrated on a delivery flight. ^ "Defence & Security Intelligence & Analysis - IHS Jane's 360". janes.com. Retrieved 2015-09-04. 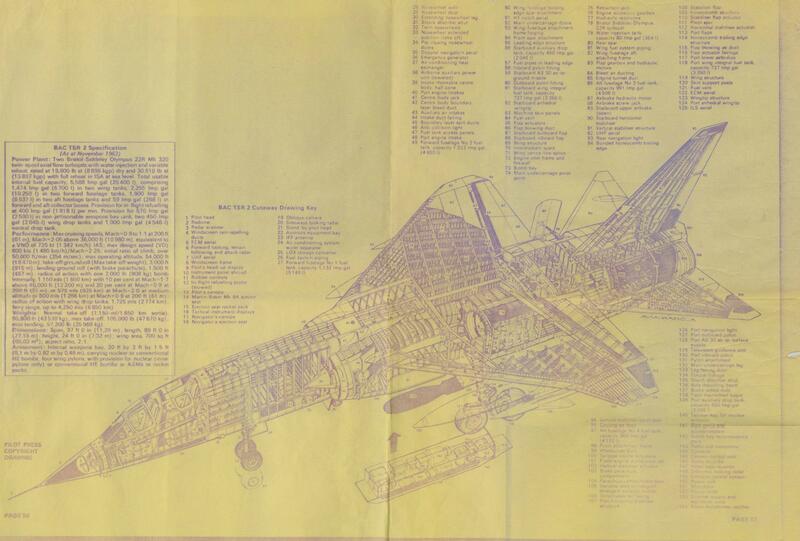 ^ "Stealth design of airplanes / stealth aircraft". fighter-planes.com. Retrieved 2015-09-04. ^ "The White Tornado" By Jim Quinn BSc FIMechE. Chapter 2, Tornado Concept Evolution. ^ "1956 | 0414 | Flight Archive". flightglobal.com. Retrieved 2015-09-04. ^ "English Electric | Armstrong Siddeley | Rolls-Royce Avon | 1957 | 0541 | Flight Archive". flightglobal.com. Retrieved 2015-09-04. ^ "Image: tna-air2-17329e53a_02.JPG, (627 × 490 px)". nuclear-weapons.info. 2008-08-29. Retrieved 2015-09-04. ^ "Image: ddSy1.jpg, (2711 × 1832 px)". i.imgur.com. Retrieved 2015-09-04. ^ Ayton, Mark. "F-22 Raptor". AirForces Monthly, August 2008, p. 75. Retrieved: 19 July 2008. ^ "Gallery of USAF Weapons", pp. 147–155. Air Force Magazine, May 2006. ^ Last of its kind. Flightglobal. ^ "EuroFighter Typhoon". fighter-planes.com. Retrieved 2015-09-04. ^ "Gripen Supercruises." Gripen International, 21 January 2009. ^ "О ходе испытаний нового российского истребителя Су-35БМ: Наука и техника: Lenta.ru". lenta.ru. Retrieved 2015-09-04. ^ Jenkins, Dennis R.; Landis, Tony R.; White, Alvin S.; Fulton, Fitzhugh L. (2005). Valkyrie: North American's Mach 3 Superbomber. Speciality Press. p. various pages. ISBN 1-58007-072-8. ^ "A Totally Superior Product" (PDF). Gripen News: 2. June 2001. ^ "Gripen Supercruises" (press release). Retrieved 2009-12-04. ^ Karnozov, Vladimir (4 September 2007). "Sukhoi unveils 'supercruising' Su-35-1 multi-role fighter". Flightglobal. Archived from the original on 24 August 2013. Retrieved 24 April 2013. ^ "What It Was Like Flying And Fighting The F-16N Viper, Topgun's Legendary Hotrod". Retrieved 2018-12-17. ^ "Saab 35 Draken". Saab.com. 2015-12-14. Retrieved 2018-03-24. At that time there was limited understanding of supersonic aviation, which is why the "double delta" configuration had been tested earlier in 1952 using the specially developed Saab 210 "Little Dragon" experimental aircraft. The maiden flight was carried out on 25 October 1955 by Bengt Olow and shortly afterwards, in January 1956, the Draken broke the sound barrier while climbing and without afterburner! ^ Powerplant, ConcordeSST —describes full cycle of Concorde's engine from takeoff to touchdown, including the turning off of reheat to begin supercruise at Mach 1.7.